A senior Pakistani government official said Friday that the death toll from a massive ISIS suicide bombing at a Sufi shrine in the country’s had risen to 80, as the Pakistani military purportedly followed through on its threat to seek “revenge” against the militants in a neighboring country. The police commissioner in Hyderabad, the nearest large city to the town of Sehwan where the shrine was attacked, said a total of 250 people were wounded in the explosion. 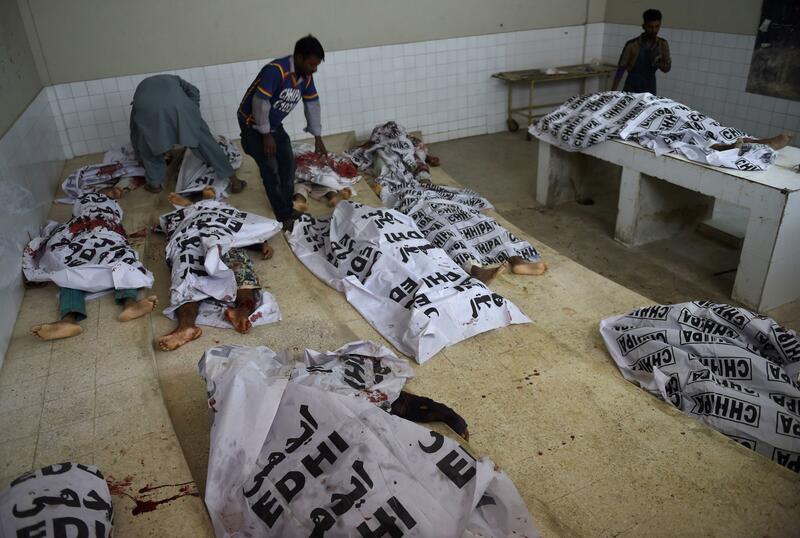 The terror attack -- Pakistan’s deadliest in years -- stunned the nation and raised questions about the authorities’ ability to rein in militant groups despite several military offensives targeting militant hideouts. It also threatened to drive a deeper wedge between Pakistan and Afghanistan. Islamabad quickly lashed out at Kabul, saying the bombing was masterminded from across the border, in militant sanctuaries in Afghanistan. Underscoring tensions, Pakistan fired a blistering round of artillery shells into Afghan territory and shut down the Torkham border crossing, a key commercial artery between the two neighbors. The Sehwan shrine, which reveres a Muslim Sufi mystic, is frequented by the faithful of many sects of Islam but the majority of the worshippers are Shiite Muslims. The Islamic State of Iraq and Syria (ISIS) group reviles Shiites as heretics. Afghan President Ashraf Ghani was quick to condemn the attack and say his security forces are battling all terrorist groups, including ISIS. An Afghan police official said Friday, however, that Pakistan had launched a blistering artillery assault on eastern Afghanistan’s Nangarhar province, where a self-declared affiliate of ISIS is based. Gul Agha Roohani, provincial police chief of Nangarhar, told The Associated Press in Kabul that Pakistan fired several artillery rounds early on Friday into the province’s Lalpur district, near the Afghan-Pakistan border. There was no immediate comment from Pakistan to confirm or deny strikes inside the neighboring country. Pakistani security forces also killed and arrested dozens of suspects in sweeping raids overnight and into Friday inside the country. The Pakistani military said it had handed over to Kabul a list of 76 suspected “terrorists” hiding in neighboring Afghanistan, demanding immediate action by Afghan authorities and the suspects’ extradition to Islamabad. A statement from the military said the list was given to Afghan officials at the Pakistani army’s sprawling headquarters in the garrison city of Rawalpindi on Friday. The military did not specify who was on the list, but it has long claimed that the head of Pakistani Taliban, Mullah Fazlullah, and other militants are hiding on Afghan soil with the objective of fomenting violence inside Pakistan. Afghanistan and Pakistan often accuse each other of harboring militants who operate across the porous border between the two countries. The shrine, in the town of Sehwan in Sindh province, honored the mystic Muslim Sufi holy figure Usman Marwandi, also known as Lal Shahbaz Qalander.